My group and I of 7 friends had a good time on this tour. Pick up location was reasonable. 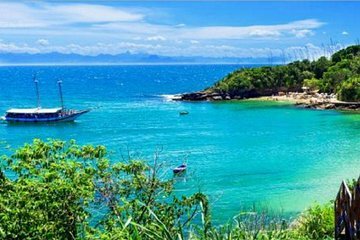 6 hours of the excursion is travel to and from Buzios. We all got on the boat and had some drinks taking in the scenery from the boat. After we went and had buffet style lunch which was truly amazing. There was no snorkeling in the water as it was just jump in and swim in the ocean with floatie tubes. No life vest were available as the safety floating precaution like other tours my friends have been on. We never touched foot on sand on any of the beaches which was a bit of a disappointment. But since we did have so much fun I give the tour a 4 out of 5. Would of been a 5/5 if we had snorkeling equipment provided and life vest.